Amazon EC2 Container Service is a highly scalable container management service that supports Docker containers and allows you to easily run applications on a managed cluster of Amazon Elastic Compute Cloud (EC2) instances. We launched the preview at AWS re:Invent and have been receiving a lot of great feedback ever since. We built Amazon ECS because many of you told us that you are using Docker to encapsulate your applications and services, and that you want to run one or (more typically) more of them across a cluster of EC2 instances without having to worry about managing it. You asked for a service that was reliable and scalable, and that allowed you to take advantage of the advanced EC2 features that you are already using. You also told us that managing a cluster, including the state of the EC2 instances and containers, can be tricky, especially as the environment grows. You need to have access to accurate and timely state information so that you can make container placement decisions, such as what instances are available and have the requisite capacity. Tracking of state grows increasingly difficult (and yet ever-more important) as the number of instances and containers grows into the thousands or tens of thousands. Amazon ECS was designed to meet all of these needs and more. You do not need to install, operate, and scale your own cluster management infrastructure. With simple API calls, you can launch and stop container-enabled applications and discover the state of your cluster. You can use Amazon EC2 with other AWS services and you can take advantage of familiar features such as Elastic Load Balancing, EBS volumes, EC2 security groups, and IAM roles. You also get several options for container scheduling, allowing you to run a wide variety of applications and to manage the placement and utilization of containers, applications, and services. 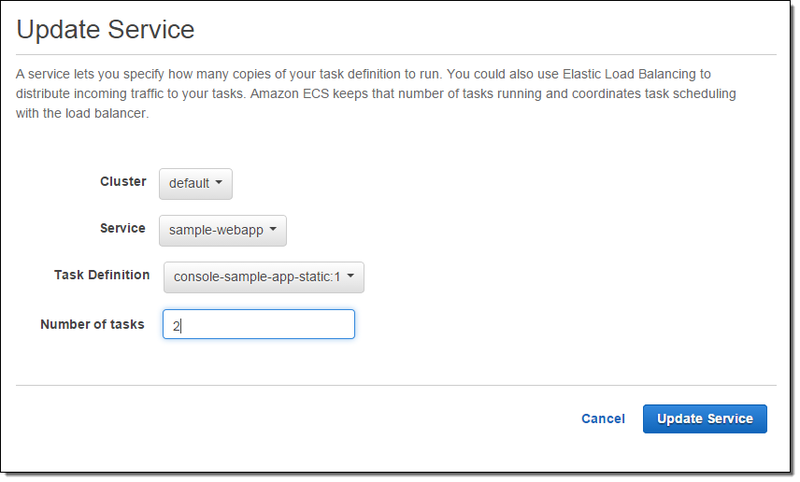 I am happy to be able to announce that Amazon ECS is now generally available! 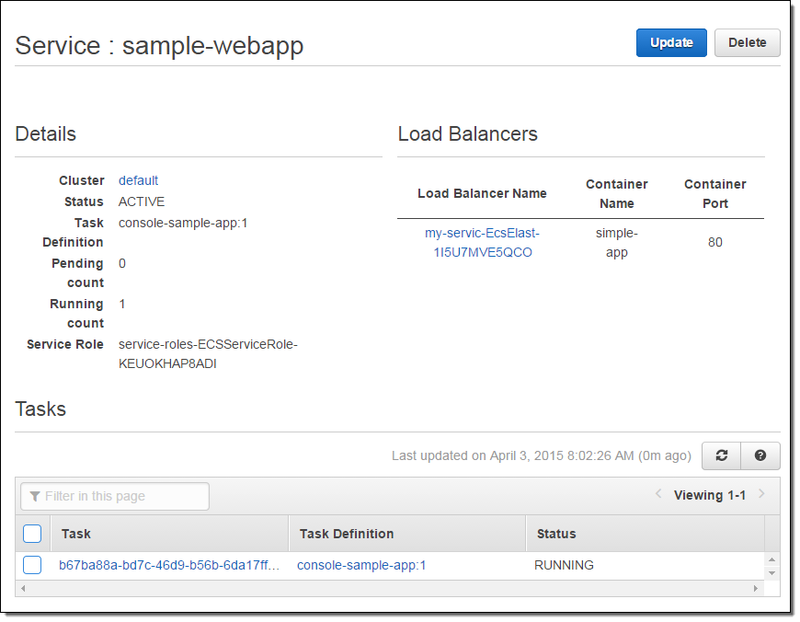 We have added some powerful new features including support for long-running applications, a shiny new Amazon ECS Console, and CloudTrail integration. We are also making Amazon ECS available in the Asia Pacific (Tokyo) region. Let’s take a look at each of these new features. 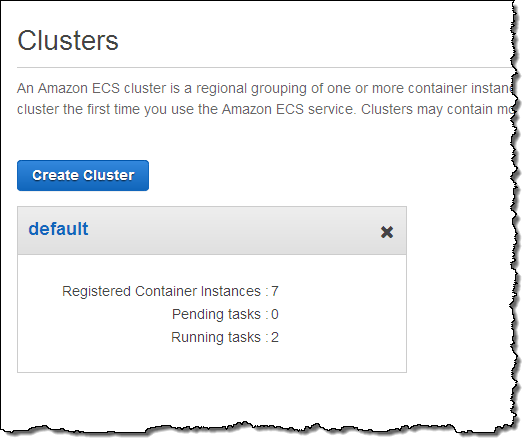 Previously, Amazon ECS included two ways to schedule Docker containers on a cluster. You could run tasks once for processes such as batch jobs that perform work and then stop. You could also make calls to the Amazon ECS APIs to retrieve state information about the cluster and then use it to power a third-party or custom-written scheduler. 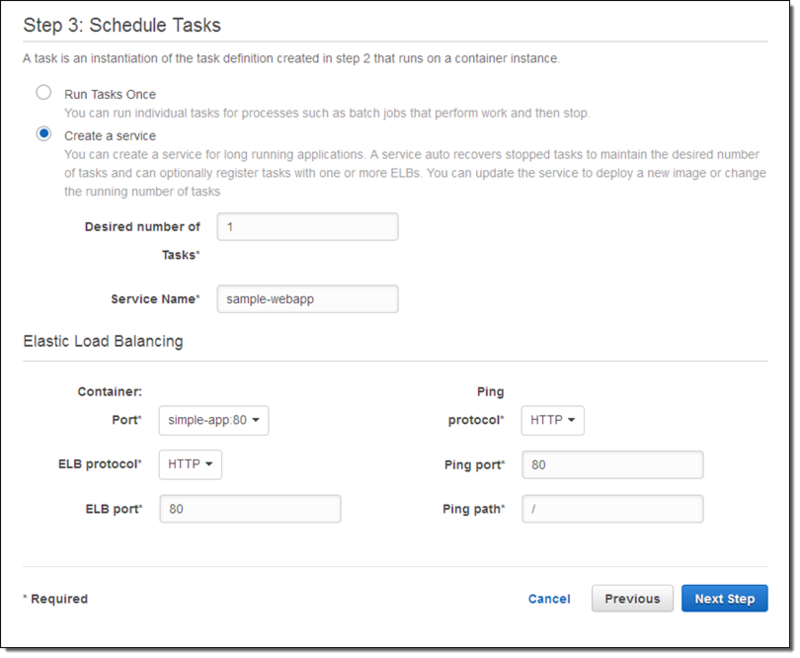 Load Balancing – The Service scheduler allows you to distribute traffic across your containers using Elastic Load Balancing. 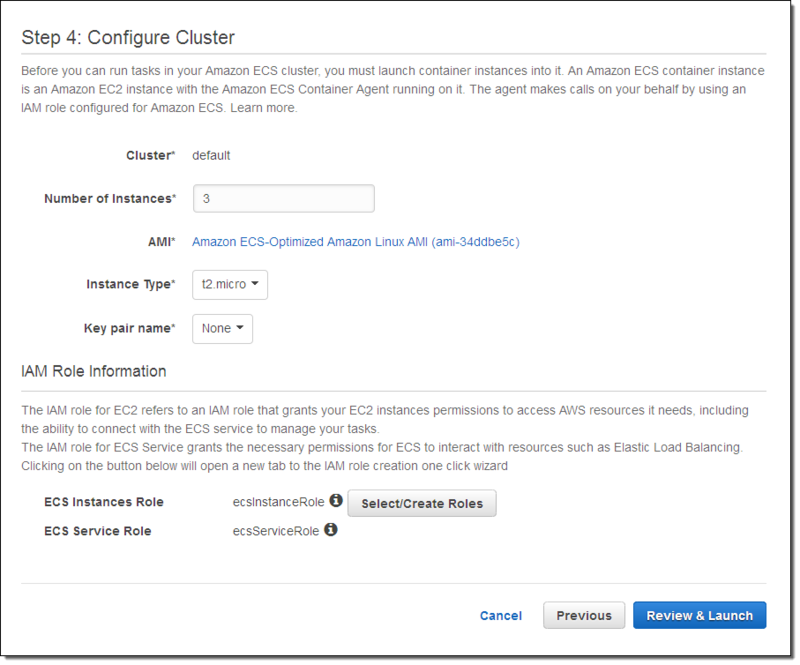 Amazon ECS will automatically register and deregister your containers from the associated load balancer. Health Management – The Service scheduler will also automatically recover containers that become unhealthy (fail ELB health checks) or stop running to make sure that you have the desired number of healthy containers available to run your application. Scale-Up and Scale-Down – You can scale your application up and down by changing the number of containers you want the service to run. Update Management – You can update your application by changing its definition or using a new image. The scheduler will automatically start new containers using the new definition and stop containers running the previous version. It will wait for the ELB connections to drain if ELB is used. You can also use these new facilities to implement a basic service discovery model. 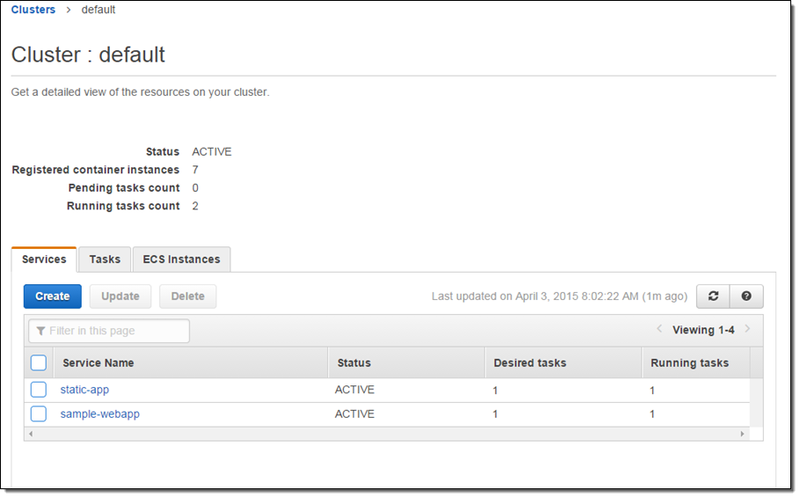 You can list the services that are running in a cluster and then use the ELB as the service endpoint. 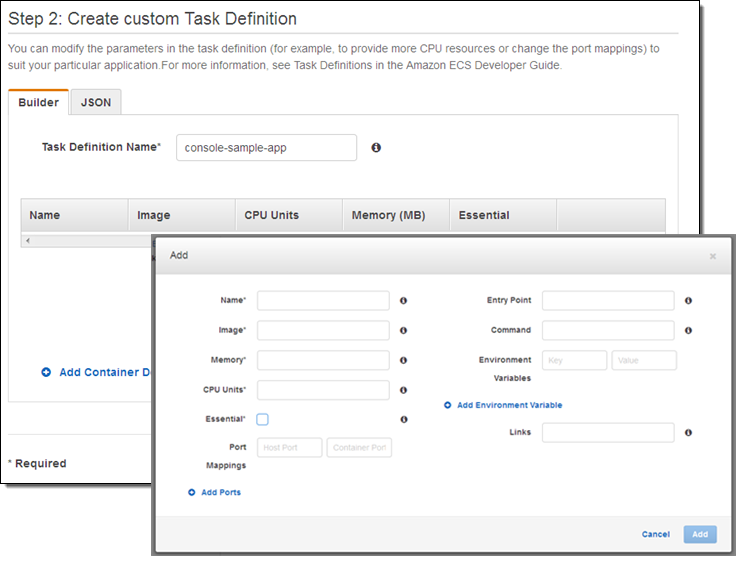 The new Amazon ECS Console simplifies the process of setting up and running a cluster. I’ll demonstrate it by creating a service that deploys a simple PHP application. The application displays content (a message and the time of day) provided by a linked container. You can also exercise all of this control, and retrieve all of the same information, by using the ECS API or the Command-Line Interface (CLI). 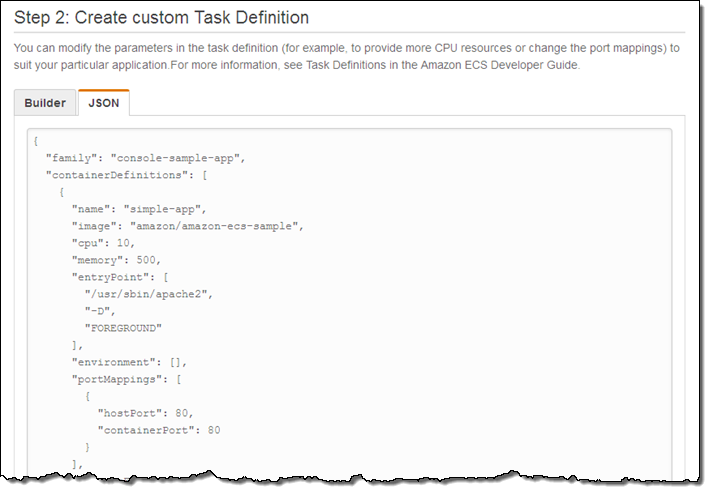 Calls to the ECS APIs are now logged to AWS CloudTrail. 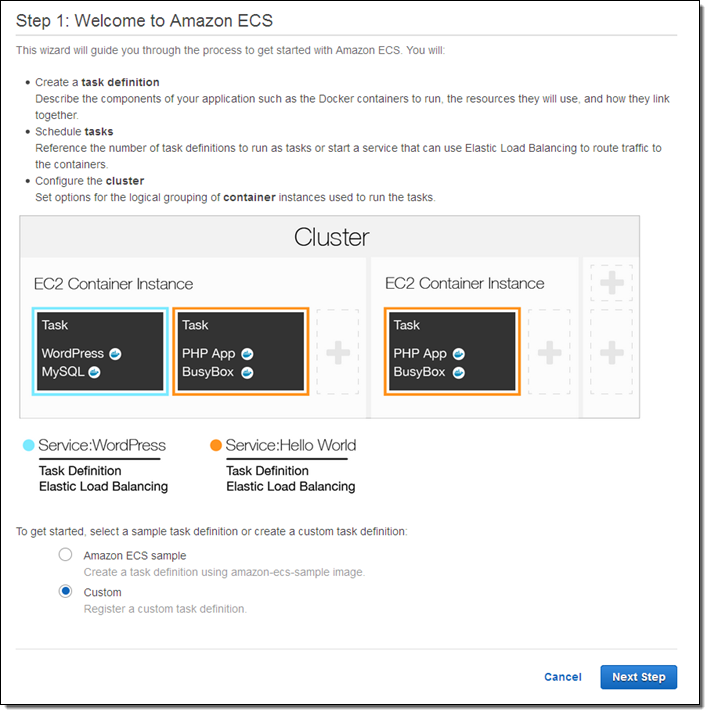 Effective today, Amazon ECS is available in the Asia Pacific (Tokyo) region. It is also available in the US East (N. Virginia), US West (Oregon), and Europe (Ireland) regions. 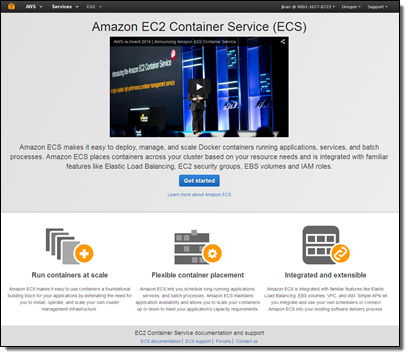 If you are new to the world of container-based computing and Amazon ECS, start by reading What is Amazon EC2 Container Service.